The Office of the Ombuds has established a lending library of eBooks and physical books housed at the J.D. Williams Library on the Oxford campus. These resources are available for checkout by faculty, staff, and graduate students. The physical books are available for checkout through the Reserve Desk on the first floor of the J.D. Williams Library. 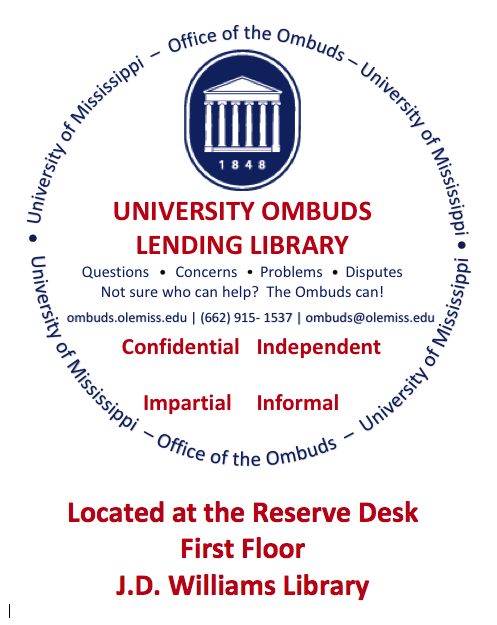 The Ombuds Library Catalog provides the most-current listing of both physical and eBooks in the Ombuds Lending Library. The physical books held at the Reserve Desk may be sorted by author or title. In addition to these resources, the Office of the Ombuds has identified some additional books housed within the UM Libraries’ general collection that may provide members of the University of Mississippi Community with insights, tools, skills, or approaches for addressing campus concerns and helping us all live up to the ideals set forth in the Creed. Links to those books are provided below. Of course, whether before, during, or after you consult any of these publications, the University Ombuds is always available to talk.